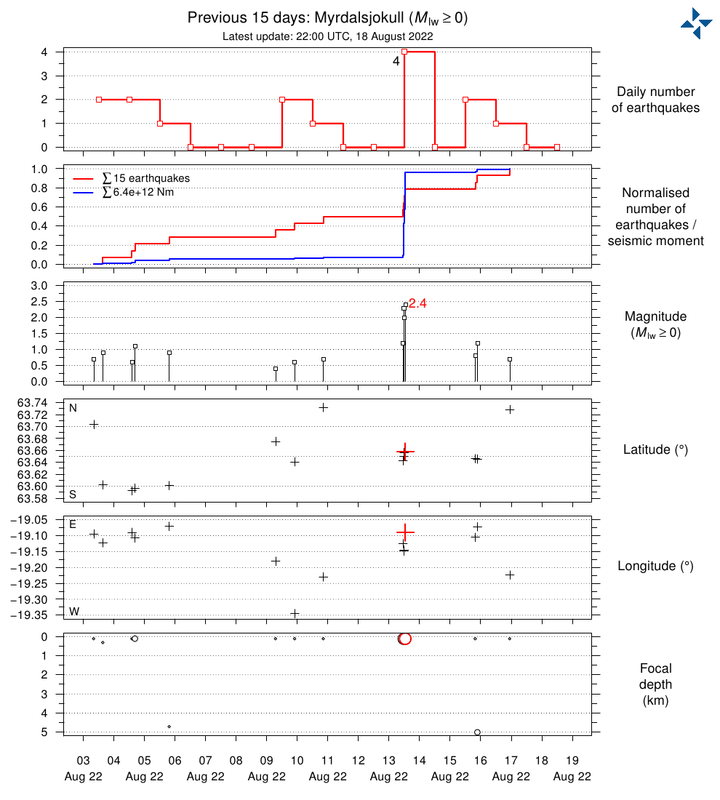 Late March, a few minor earthquakes happened in the sleeping heart of Iceland. They were hardly worth noting, at M1, and 4-5 km deep. The centre of Iceland is far from anywhere. It is calm and is hard to reach, thus receives little attention and fewer visitors. Perhaps we should just ignore it. Here, dead in the centre of Iceland, lies a forgotten volcano. It hides itself in silence: covered by the ice cap called Hofsjökull, Iceland’s frozen heart has been asleep for many millennia. Carl in the Mammoth guide writes The Hofsjökull – Kerlingarfjöll volcanic system comprises two evolved central volcanoes. The Hofsjökull volcanic caldera is 30 square kilometers large and the other central volcano is the dormant-to-extinct Kerlingarfjöll central volcano. He assigns it the lowest risk level, and most would agree with this. Let’s forget about it: Iceland has no shortage of world-leading volcanoes, any one of which could erupt within the next 5 years (just based on usual eruption frequency), and a dormant heart hardly features. Iceland doesn’t need to worry about Hofsjökull – a few tremors won’t wake this heart. Look harder, and still there is little to be excited about. The glacier, one of about 20 in Iceland, may just about be the northernmost of the major ones. It is also the country’s third largest, although in common with the others, after centuries of growth it is now rapidly retreating. The melt water keeps part of the surrounding highlands green, an oasis in a hostile, barren land. But wait. Only fairly recently have soundings revealed the bedrock underneath the glacier. And this MRI gave the watchers a big surprise. The heart they saw is no midget. It can hold its own against Katla, Hekla, Grimsvötn. This secretive, hidden mountain, so poorly known that it has no name other than that of the glacier, is the largest volcano in Iceland. Who knew Iceland had such a big heart? Perhaps these few, minute tremors are worthy of some attention. After all, ignore heart murmurs at your peril. Jon wrote in his blog that there are no known eruptions of Hofsjökull during the last 12 thousand years that he knows of, and mentions that very little has been published on it. The reason is a lack of forensics opportunities in Iceland’s inaccessible, secret heart. We need to do exploratory heart surgery. Hofsjökull volcano. It is a large ice-filled caldera. From afar it looks like a giant ice dome. It makes Hekla look like a baby volcano. Credit: Irpsit. Published previously on VC. Amidst the little there is known, two unconfirmed facts are commonly reported. Let’s do a fact check. Many places state that Hofsjökull is the largest volcano in Iceland. However, few say by what measure! And both Bardarbunga and Öræfajökull are also said to be the largest, so there is competition for the title. 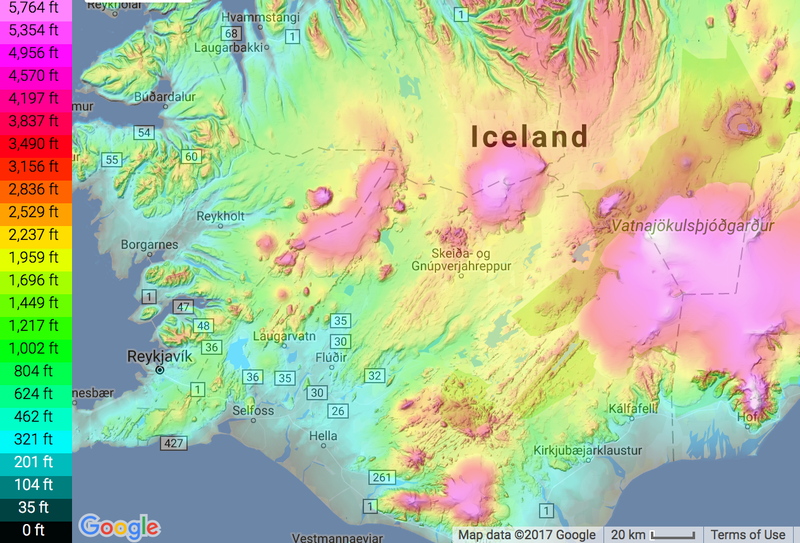 The volume of Hofsjökull is reported as 200km3, and the surface area is a little over 900 km2 (a bit larger than the retreating glacier that covers it). Öræfajökull has a much smaller surface area of 400 km2, but it has a reported volume of 370 km3. It is very difficult to find good numbers for the other volcanoes. But it seems that by volume Hofsjökull is not the largest. 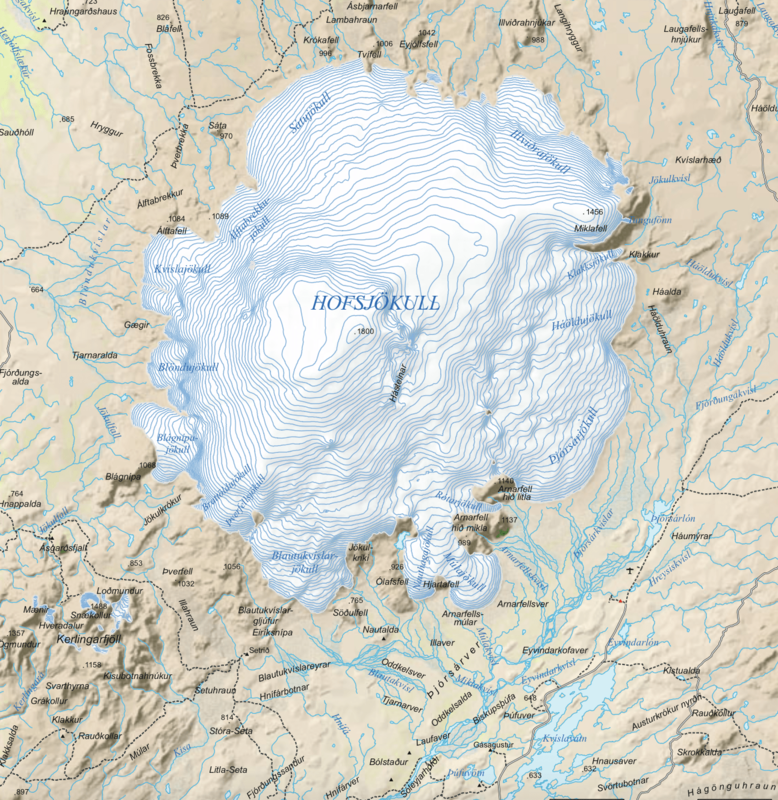 Hofsjökull may however be the largest by surface area. 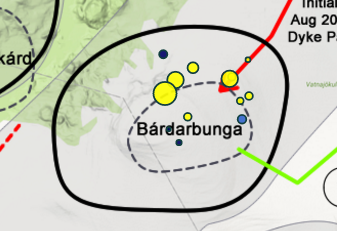 Estimating from maps, Bardarbunga seems ‘only’ about 600 km2 in area: it has to share with quite a few neighbours and lives in a cramped space. Hofsjökull has the world to itself, with room to spread. One can also look at the size of the full volcanic system, the central volcano plus the fissure swarms. For Hofsjökull, this covers 2200km2, slightly less than that of Bardarbunga (2500km3) and Askja (2300km3), making it the third largest in Iceland. We will give this ‘fact’ a conditional pass. There is one measure, the base area, by which Hofsjökull might indeed be the largest volcano in Iceland. Whether by volume remains to be seen. By size of the volcanic system it is not. The second ‘fact’ is that it has an east-west orientation, making it part of the MIB (Mid Icelandic Belt). The MIB is an imaginary line drawn on maps (often dashed) to connect the western and eastern volcanic zones. Here the evidence is unequivocal: this band does not exist. The orientation of Hofsjökull, like all other volcanoes in the area, is northeast-southwest, bending to the north. This fact check comes up negative. A false of heart, as Shakespeare might say. The Hofsjökull glacier lies in between two larger glaciers, Vatnajökull to the east and Langjökull to the west. The name Hofsjökull came from the Hof farm to the north. People in the south of Iceland had a different name for it, but the northern one won out – it was too remote to start a fight over naming rights! There is vegetation to the north and to the south, but otherwise the surrounding land is barren, an undulating high-altitude plain covered in gravel and frozen lava where little to nothing will grow. This is the central highland, a land traversed when needed but not lived in, and very poorly known. There are two gravel roads running north-south, on either side of Hofsjökull, but they don’t come particularly close – they are not the way into Iceland’s heart. On the west is the F35, the Kjölur road; on the east the F26. F-roads are mountain roads, where your rental car will not be allowed and for good reason. And in any case, rivers which flow from the glacier in all directions make it difficult to get much closer – no bridges here! Pictures on the web tend to show the glacier either from a large distance, or from the air. This hints at its (in)accessibility. To the southwest is a broken-up mountainous area called Kerlingarfjöll, itself a remnant volcano. This is a popular tourist area, with spectacular scenery. But getting from there to Hofsjökull is non-trivial. Get lost here and your life is in danger! Get caught in an unexpected summer storm, and you can die! People had only occasionally visited the margins of the glacier, and the first recorded visit to the central ice plateau, the first cross-your-heart, was only in the 1950’s. Too much security isolates: Iceland’s heart lives alone. If you do manage to visit, you’ll find the next barrier. Hylahjarta is covered by a domed glacier 30 to 40 kilometer in diameter and over 1700 meter high. The glacier currently covers around 830 km2 (it used to be well over 900 km2) and has an ice volume of 200 km3. A quick calculation shows that the ice is on average 250 meter thick. Small nunataks, Hásteinar and Tanni, peak through the ice, the only showings of the heart. The longest outlet of the glacier runs 19 kilometers southeast but it is now a few kilometers shorter than it used to be. Hofsjökull glacier is the main source of several rivers including the þjórsá (Thjorsa) which, at 230 kilometer, is Iceland’s longest river. The melt waters also feed the Héradhsvötn, Ölfusá, and Blanda. Iceland has a number of separate volcanic zones, each one a rift fragment which does not always link up well with the others. 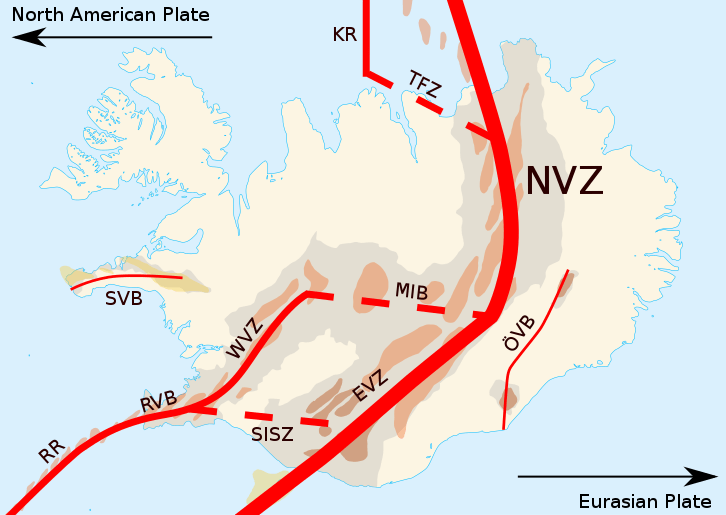 The Reykjanes zone (RZ) is an obvious extension of the Mid-Atlantic rift. In Iceland, it has linked up with the WVZ (western volcanic zone) to form a combined rift, terminating at Langjökull. On maps you can still see it is a patch work. It formed about 6 million years ago – before that the main rift was further to the west. Further north, there once was a spreading rift through the Skagafjörður Valley running north-northwest from where is now Hofsjökull and there are several large extinct volcanoes (such as Tinna) here, but it was short-lived. Instead, a northern rift formed further to the east. This became the North Volcanic Zone which has been a stable feature for 5 million years or so. But connecting to the WVZ was never its strong point. About 3 million years ago, the NVZ began to extend further southward, forming a new rift zone, called the eastern volcanic zone or EVZ. (Geolurking likes to call it the Dead Zone.) It took up most of the spreading, leaving the WVZ with a very slow spreading rate. At the moment, the EVZ spreads at some 2 cm/yr and the WVZ at 5 mm/yr. Iceland continues to have parallel spreading centres. The model of rift-jumping, where new rifts develop and old ones die, does not fully work in Iceland: the country is more complex than that. In between the WVZ and the EVZ is the South Iceland Microplate, a fragment of crust cut off from both the European and the American plate. At the southern end the microplate is bordered by the South Iceland Seismic Zone, acting as a transform fault, where Iceland’s largest earthquakes tend to be. At the northern end, the microplate boundary is ill-defined. The area where the boundary should be is called the Mid-Iceland Zone, the Mid-Iceland Belt, or the Hofsjökull Zone (HZ), and on maps is shown as a dashed line running from Langjökull to the east, but it is totally inactive and seems not really to exist as a boundary. It is certainly not an east-west rift, as often indicated. In between the WVZ and EVZ, unconnected to the other rifts, is a short rift that connects Hofsjökull and Kerlingarfjöll. It runs parallel to the EVZ and WVZ, roughly southwest to northeast. It has little or no spreading, but this has been turned to an advantage. While other volcanoes eventually migrate away from the spreading rift and become magma-starved, here the volcanoes continued to grow. That is how the ‘largest volcano of Iceland’ (but see above) managed to form. The way I look at it, over the times as the main crustal weakness migrated eastward, a series of parallel tears developed as the two plates were pulling apart. Each one is even now still capable of rifting. Most activity is in the EVZ, but the other rifts have not died – just aged. 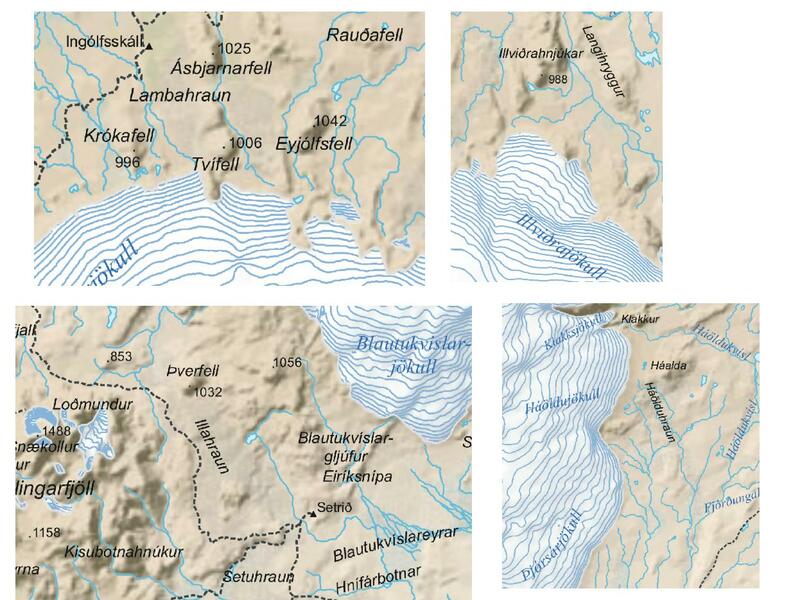 The Iceland map nicely shows a collection of different rifts, including to the south and to the west (Kjölur) of Hofsjökull. All run parallel to each other, southwest to northeast, further north tending to bend towards a more northerly direction. That is not to say that east-west rifting has never happened in Iceland. Before the WVZ and NVZ, more than 7 million years ago, there was an important line running eastward across most of Iceland from the Snæfellsnes peninsula. It mostly died out after the WVZ formed. But it remains active on the peninsula; it appears to have had a new lease of life and started extending again eastward. Once it re-reaches the WVZ, it may re-invigorate the WVZ and perhaps the main rift zone in Iceland will jump once more, back to the west. The ice cap hides a hole-in-the-heart, a huge caldera, 7 by 11 kilometer wide and 650 meter deep. The bottom is at 980 meter above sea level, while the rim peaks at 1650 meter, on the east where the Hasteinar nunataks are. The bottom of the crater is at the same level as the bottom of the glacier, a little above the surrounding land. The ice in the caldera is 750 meter thick. On the western side, the caldera rim may be as low as 1250 meter. There is no melt water lake underneath the ice in the caldera, probably because of limited geothermal heat – this is no hot-blooded Katla. The caldera is probably fairly young, as it is not filled in by debris or later eruptions. Fairly young means that a date from the most recent ice age is most likely. The volume of the caldera is roughly 30 km3. It probably formed through collapse, when the magma chamber underneath fed a fissure eruption. Assuming that a third of the magma ended up on the surface, one should be looking for a 10 km3 lava shield. Something may lie underneath the glacier. The basaltic rocks at the northern edge are different in composition from those in the south and must have formed independently. The rhyolitic nunataks are related to rocks on the east and southeast side. That may fit a model where the southeast (and central) part have a different magmatic origin to the northwest part. Some slight difference are also seen in the bedrock map. In the southern part, the main alignments are north-south. 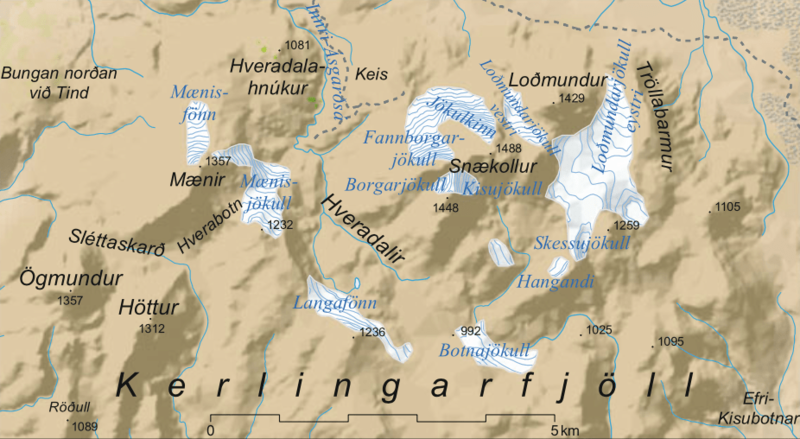 There are two prominent ridges, one from the south-western corner of the central volcano which separates Blautukvislarjokull and Bhignipujokull, and one further east, on Thjorsarjokull, north of Arnarfell. To the north side, the main features run north-northeast, with two parallel ridges on either side of a valley, on the northeastern side of the mountain. But how significant this difference is remains to be seen. The peculiar deep valley underneath Blautukvislarjokull looks like erosion from a catastrophic jokulhlaup from the central volcano. The deep north-south valley north of Mulajokull may be tectonic. Its surface is 100 meter below the countryside, and once the glacier has melted, a lake will form here. To the south, along the Þjórsá river, is the Þjórsárver wetland and marshes, 140 km2 of green oasis amidst the arctic desert. It is the largest vegetated area in the central highlands, and this 0.5% of the country’s area has the reputation of being the only pristine vegetation in all of Iceland. Inaccessibility helps – it is easier to protect nature when people can’t easily get to it. Being wet is also a bonus. The Þjórsá river captures about half of all the melt water from Hofsjökull, an amount that is likely to increase over the next century while the glacier is melting away. After that, the water flow should reduce back to its current amount. But the wetness turned out to be a mixed blessing and has turned its protection into a rather soggy battle ground. The site is suitable for hydropower energy generation and the Icelandic government was at best luke-warm to this cold oasis and rather hotter on its energy (and króna) generating potential. In 2013 the relevant minister proposed to cancel Iceland’s entire nature conservation law, just to open up this one area to exploitation – taking a sledge hammer to treasure in order to sell the shards. The idea was to turn Þjórsárver into a reservoir – the Þjórsá is after all the longest river in Iceland, eminently suitable for this, and governments in need of money tend to view nature as an economic black spot! Hopefully the protection has now improved but the plans have not died: they just resurface under a different name. Underneath the green surface is permafrost. At times the ice pushes up 1-meter tall ridges, creating small dry areas amidst the wet. These are called palsas, and they are common in the arctic but declining in Iceland, probably due to the rising temperatures. To get them you need an insulating cover of vegetation, and a very high water table. As the ground rises with the ice, it dries out and the vegetation suffers. The palsa loses its insulation. As a result, the ice melts, the palsa subsides and now a pond forms – and the cycle begins anew. This is a dynamic landscape, at least for those with patience. Þjórsárver differs from seemingly similar areas elsewhere in the arctic. You would normally form peat in such nutrient-poor areas. But the Þjórsárver gets a regular dusting of tephra and is much more fertile. This helps the vegetation, and this keeps the soil carbon-poor; peat does not form. Birds love it. The UK is proud of its massive flocks of wintering pink-footed geese (don’t ask – I don’t know where they got their socks from). Here is where they breed and feed, living of the melt water. The abundance of Þjórsárver stems from more than water: it takes its life from a bleeding heart. The four ridges may have an ice age origin. The Gjálp eruption in 1996 formed such 100-meter tall ridges, from fissure eruptions which were constrained by ice. One can speculate that the Hofsjökull ridges formed similarly, albeit constrained by the far thicker ice of the ice age. Here, in the centre of Iceland, there was actually fairly little erosion from the ice age. This was near the centre of the ice cap, and the ice didn’t move much. So these structures may be quite old. On the other hand, the caldera itself can’t be that old. Until the ice melts, any interpretation of the ridges is speculative. One suggestion to its age, albeit inconclusive, comes for the Atlantic ocean. The sediment in the ocean shows several distinct ash layers which are useful for dating markers. The so-called ash zone 3 (not to be confused with the Faroe Marine Ash Zone III which is a different thing with the same name) was deposited approximately 305,000 years ago in the North Atlantic. It is found over a large area of ocean floor south of Iceland; the ash was spread widely by rafting ice. It has been suggested that it came from either Hofsjökull or from Krafla (and one can argue whether Krafla existed at that time). The composition is rhyolitic, and the volume of the ash is estimated at about 6 km3. Within the depth of the ice age (‘always winter but never christmas’) this was an eruption worthy of the white witch; it tore the heart out of Iceland. There are several lava flows in the area surrounding the glacier, and they are considered young. Iceland went through a burst of volcanic eruptions after the ice melted, and ancient Hofsjökull apparently also came to this party, still a young-at-heart. Kjalhraun is an odd one. It is dated to 7800 BP but not normally considered as part of Hofsjökull because it is much closer to Langjökull. Kjalhraun is a large lava shield which covers an area of some 20 by 20 kilometer, about 180 km2 in total and with an estimated volume of 11 km3; it lies 20 kilometer east of Langjökull. This region is in the Kjölur highlands, where the volcanic zones of Hofsjökull and the WVZ overlap: it is not immediately clear which one was the source of the magma. The lava shield is bordered on the east by the Kjölur fissure swarm. This swarm runs parallel to Langjökull, but after touching Kjalhraun it bends towards Hofsjökull. So, even though the lava shield itself is closer to Langjökull, the nearest fissure lines up better with Hofsjökull. Interestingly, the volume of Kjalhraun is about what is needed to explain the caldera of Hofsjökull! I’ll take that as a coincidence, though. Illahraun is a young lava flow at the southern edge of the ice cap. Here at least the relation to Hofsjökull is not in dispute! It is the largest lava field abounding the ice, and has a crater row south of Brattalda, in between Hofsjökull and Kerlingarfjöll. It has formed after the ice age, and from the fact that it appears from underneath the glacier, one can surmise it formed during the warm period when the glacier was much smaller, between 4000 and 8000 years ago. (There is a lava field with the same name on Reykjanes, confusing google no end.) This lava flow is very rough and difficult to traverse, a sign of its youth. Lambahraun is a fissure vent to the north of the ice cap (another unrelated region with the same name exists south of Langjökull, where google likes to send you instead). It may have come from Tvífell, a solitary 150-m-high cone, or from vents now underneath the ice. A lava field near Mt Illvidrahnukar (“bad weather peak”), on the northeast side of the glacier, lies in the same direction as one of the ridges underneath the ice cap: it may have erupted from the northernmost point of this ridge. 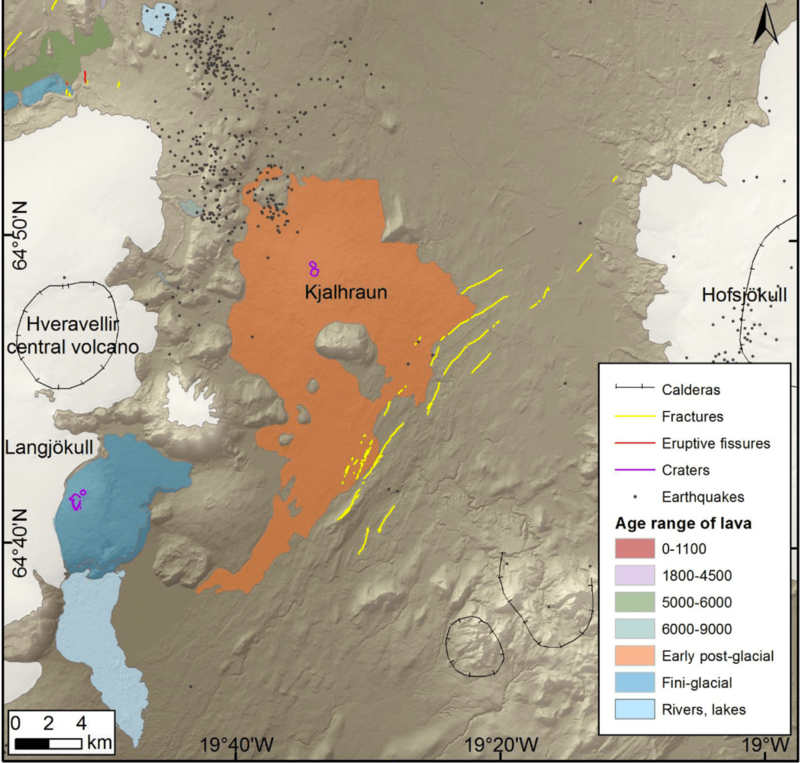 Haolduhraun (not to be confused with the eruption of the same name at Torfajokull – repeating the mantra that google may mis-lead) is due east of the central crater and comes from underneath the current glacier. All these lava fields are thoelite basaltic, and all have been suggested to be post-ice-age, i.e. holocene, although the lavas have not actually been dated. Here lies a task for the intrepid explorer volcanologist! 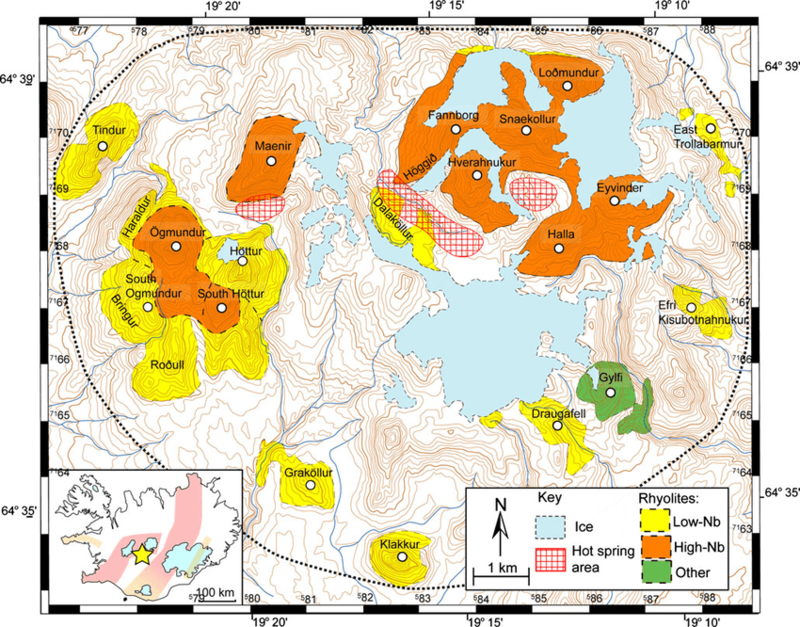 The locations of the four lava fields mentioned in the text, suspected to be of holocene origins. The broken mountains to the south recall violent volcanic eruptions, which formed rhyolite peaks and two table mountains, tuyas. (If you are surprised by the rhyolite, as Iceland is basically basaltic, about 10% of the lava in Iceland is rhyolite, and about 20% of Kerlingarfjöll, so it is high but not unusually so.) This volcano was active during the last two ice ages and the previous interstadial (the tuyas formed during one of the ice ages, as they come from eruptions underneath the thick ice layer), but there have been no eruptions here since the last ice age ended. The lava formed between 350,000 and 68,000 years ago, in two phases, each of which started out as basaltic and became rhyolitic as activity declined. The area is among the most beautiful in Iceland, with spectacular red and orange colours in the rocks amidst its famous fumaroles. It used to be a summer ski area, but that went away with the colder climate of the past and the ski resort closed in 2000. Hiking has now taken over: harder work, but you get to see more. The entire area is very popular with summer tourists, and even has its own website, http://www.kerlingarfjoll.is (actually, this is a tourist travel site). It is being considered for a nature reserve. From: Rhyolites at Kerlingarfjöll, Iceland: The evolution and lifespan of silicic central volcanoes, Bulletin of Volcanology, 72:523–538 (2010) Stephanie Flude, David W. McGarvie, Ray Burgess, Andrew G. Tindle. The highest point is Snækollur (1488m), which is the location of the rock pillar Kerling, the female troll which the region is (allegedly) named after. There are two calderas, 17 and 14 km2. Both are sites of intense geothermal heat, although in separate areas which do not cover the full calderas. The lower Hveradalur valley is known as the fuming valley! It has hot pools, boiling puddles, bubbling mud pools (which change location from year to year), fumaroles, and sulphur springs, with intensely coloured surroundings due to the fallout, one of Iceland’s true wonders. Not even the minister of industry would try to flood this one! (Ok, maybe that statement was optimistic.) The fumaroles get to temperatures as high as 150 C. The water is heated by deep circulation which makes it boil at depth: there is no direct interaction with magma. An eruption here is unlikely, to say the least. But don’t say never: rhyolite volcanism can have dormant periods of tens of thousands of years, and it is possible that Kerlingarfjöll will erupt again in the future. Just not now. Where Hofsjökull hides in isolation, Kerlingarfjöll is open for tourist business. Its beauty melts any frozen heart. If you happen to be in Iceland and want to go hiking here, in spite of its popularity do treat it like the mountain it is (altitude ranges from 700 to 1400 meter) and take adequate precautions. Expect the weather to be reliably worse than you had counted on, and when hiking remember that rivers are forded – not bridged. Also, it takes surprisingly little water to float a car, even a four wheel drive. Iceland’s secret heart hides its largest (possibly) volcano: inimitable, inaccessible, and invisible, long unknowable and undiscoverable. The huge caldera was uncovered only from soundings. Its presence shows that there have been large eruptions here – whether explosive or effusive is not known. The fact that the crater floor is a little above the surrounding country side suggest it may have formed from subsidence, drained of its magma through a distant fissure. The evidence is now gone, covered up. But in spite of its age, this is not a heart of stone – it still has a soul. There have been one or more fissure eruptions even during the holocene. And its reach remains long, befitting its size – here is a possible culprit for the large Kjalhraun eruption. It feeds the largest river in Iceland, and contributes to many other rivers – its spreading arteries. Iceland’s heart occupies its own rift, a place in between, a might-have-been; it lives in its own world. Around it are better known areas: the wetland wonders of Þjórsárver, the sunset colours of Kerlingarfjöll, beauty to break your own heart. But these are distractions, barriers to keep you away from the real heart of Iceland. The rivers and isolation further barred visitors, to such a degree that older maps of Iceland often omit Hofsjökull altogether, depicting an empty heart. Even scientific truth is hidden: many sites state its imaginary east-west alignment, seen better with the eye of expectation than in the harsh light of the satellite map. What does the future hold? The ice which keeps the heart frozen is already unstable and is expected to melt, and even though it will last longer than many other Icelandic glaciers, by 2200 AD it will be mostly gone. What will it reveal? And will this bring out new eruptions? That can not be excluded, although we don’t know for sure. For now, eruptions remain implausible: the heart must pause to breath. Other places in Iceland will take precedence. to the flame which smoulders within. There will yet be another season of the heart. Kjalhraun is discussed as part of Hjartardottir et al., Journal of Structural Geology 91 (2016) 39e53, where the WVZ is described in detail. The author’s name is an example of nominative predetermination: it befits the topic of Iceland’s heart! Some information on the wetlands and palsas can be found in the book ‘The Soils of Iceland’ by Olafur Arnalds. The stories regarding the development threats are readily found on-line, on sites of varying accuracies and biasses. The extreme view is on www.savingiceland.org; a more balanced report is in https://grapevine.is/mag/articles/2014/02/10/fit-for-print/ albeit still rather critical of the Icelandic government. I have not found non-conflicted sites supportive of the government’s position. Thanks Albert, for introducing Hylahjarta (I once knew a Carla, it’s not a suitable name for any volcano 😀 , just a matter of opinion). And putting it perspective in Icelands volcanology. Very nice article. I would volunteer to take any lavasamples overthere, but certainly would get stuck, prob within an hour! Hello I was in Hofsjokull in summer 2013, after a very rough drive with my jeep, over huge boulders, yes the region is in fact difficult to access but there is a jeep track (usually only for large jeeps) that originates from the more famous Sprengisandur road, that leads almost to the edge of the ice cap. Both Hofsjokull and Kerlingarfjoll are not extinct!! They are active, as they both have big geothermal fields. In Kerlingarfjoll this is often visited by some tourists and icelanders in summertime. Hofsjokull is indeed the largest volcano in Iceland, and quite tall, 1800m high, making Bardarbunga feel a bit small. Torfajokull has also a very large caldera, larger than Bardarbunga, but its ice cap is almost gone. The post uses one of your images which I guess came from that trip? You wrote about it in VC. Regarding the size, I wrote There is one measure, the base area, by which Hofsjökull might indeed be the largest volcano in Iceland. Bardarbunga is larger when considering the size of the full system, and Oreafajokull is larger in volume (not that easy to measure), but Hofsjokull’s volcano itself (excluding the rifts) covers a larger area than the others – probably. But at least three of Iceland’s volcanoes can claim the title ‘largest’. Anyway the article is impressive and makes justice to such a forgotten and yet massive volcano. As you said 3 volcanoes can claim that title. But actually the largest caldera might be Torfajokull (but Hofsjokull still is larger when considering the outskirts of the caldera). For both there is evidence of very large explosive Pleistocene eruptions, in the range 20km3+. It is part of my “agenda” to bring an increased awareness of the massive potencial of these two volcanoes, often forgotten. I think Hofsjokull was once the center of the hotspot. It fits right in its track. Actually a line of these lines form between Snaefellsjokull, Langjokull, Hveravellir, Hofsjokull, Tungnafellsjokull, Bardarbunga, Grimsvotn (and possibly Oraerajokull). Isn´t this impressive? Oraefajokull is in my opinion not going to be a problem for quite a while. I am 26 years old, and would have to be realy “lucky” to see it erupt in my lifetime ( considering I make it at least to the average life expectancy or some more). Currently there are no indications of a magma influx into its deeper feeder systems. And even if that starts tomorrow, it still lasts a while before anything gets activated. 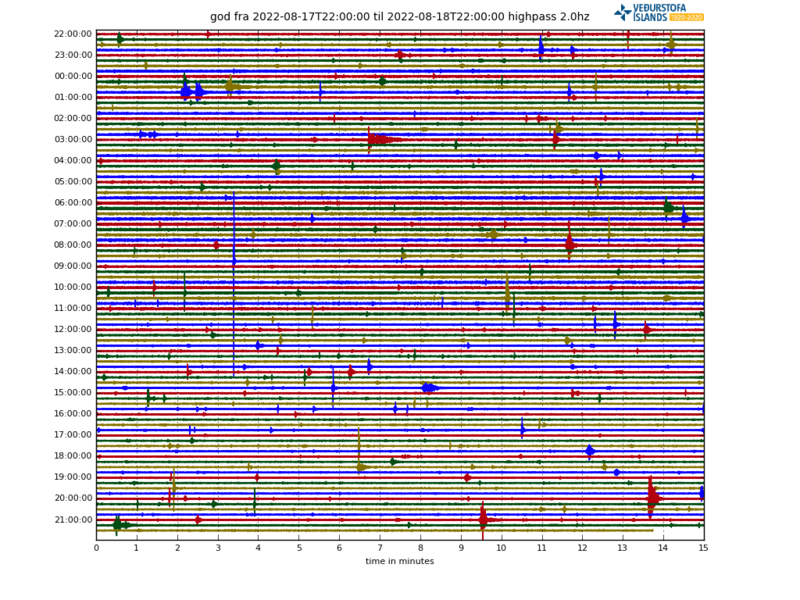 So until we see a reactivation of the fresh magma feeder system, I wouldnt focus too much on Oraefajokull. Perhaps a corner of the eye, but thats it. 🙂 I have mapped its seismicity and its not very impressive. Most if not all is tectonic in nature, and down to around 16km. Below it are 3 or 4 quakes at ~20km depth, but thats it. The crust is around 35km thick in the northern part of the volcano, rising then up towards 30 to south. So we need to see atleast around 28-30km EQ depths under Oraefi before we can talk about renewal of the feeder roots. There are still possibilities that it has already recieved several magma influxes in the past 300 years, or it has an open feeder system, which is perhaps less likely. The best example of an active feeder root is at Katla, which in the past few years has seismically the most active deep system in Iceland. I reckon that Oraefajokull will follow a similar process to that which occurred in Eyjafjallajokull in recent decades. 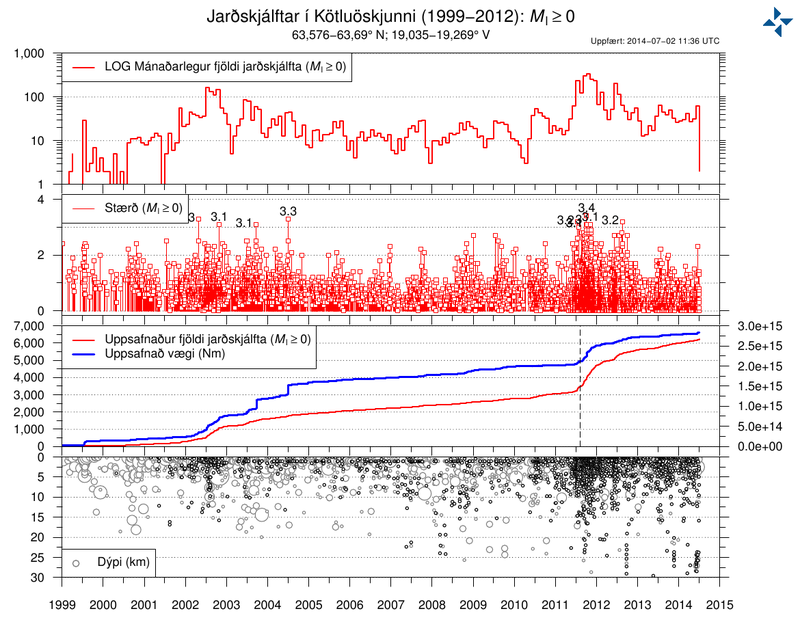 Eyjafjallajokull was quite seismically active at least since 1999, so it had at least 11 years of seismicity, following about 180 years since last eruption. Oraefajokull has had 300 years since its last eruption. Its possible that as seismicity starts now, it could run towards an eruption within some decades, but not within the next 10-15 years at least. Hofsjokull is even quieter. I don´t foresee any eruption on it, in many decades. But I remember a remarkable geothermal event that happened in Hofsjokull back in 2012 or 2013, as a small glacial flood happened towards the north of the ice cap, with strong sulphur smell. Apparently, something happened back then under Hofsjokull and we even couldn´t notice it. The EQ detection network is limited and apparently small swarms at Hofsjokull (M1 or M2) could be undetectable. This reminds me also of a local study of Snaefellsjokull volcano. A local team from Reykjavik monitored the volcano one summer, and discovered many hundreds of small earthquakes in that volcano which were never detected by the IM website. This is something to keep in mind. And the same can be happening at Oraefajokull. But as we have seen in Tunganellsjokull things can change pretty quickly and dramatically. 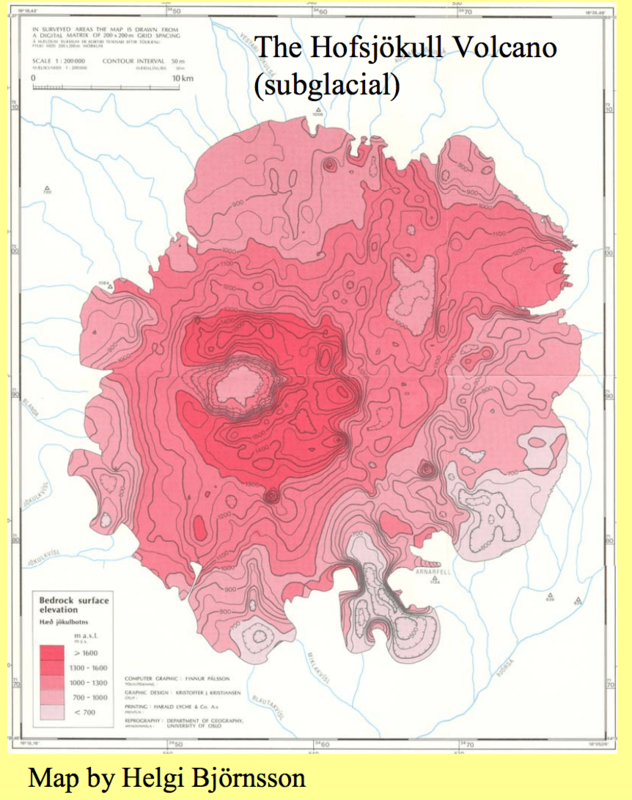 Tungnafellsjokull was asseismic prior to Holuhraun, also with a long period of thousand of years since previous eruption. 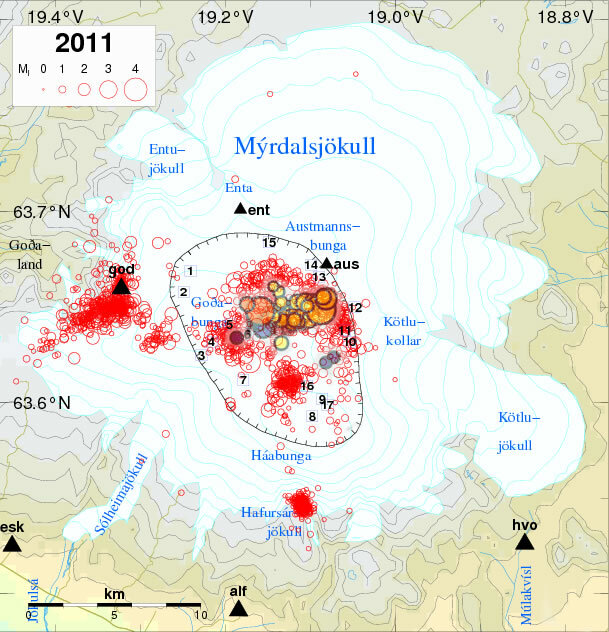 It is located in a region with a very thick crust, and still it endured several deep and shallower swarms following the Bardarbunga caldera collapse event. Black swan events are possible, especially in Iceland. Better question: Are any instruments close enough to pick up low-level events? It’s entirely possible that the drums in the deep are busy, but beyond hearing. So… you’re saying a moped won’t make it? Great article on a not so well known volcano. Thanks! Oroville is at it again, they have to use the broken spillway today. Below is the rededicated DWR you tube video. Pseudo controlled maybe, but definately not controlled. If the “controlling” authority’s action seem like something from a Three Stooges movie…. well “Form follows Function”. If it looks like a duck, walks like a duck, and quacks like a duck…. there is really good chance that it might be a duck. The part about Oroville that intrigues me, is that the damage to the,armored spillway occurred right where the flow reached enough speed to generate a vacuum and the cavitation bubbles could “hammer” the concrete. The main spillway failure occurred at a location that was previously found to be structurally compromised several (many) years ago, but no significant repairs were deemed necessary ATTM. With the absence of enough rain to fill Oroville to sufficient level to crest the main spillway gates (aprrox. 850′), there was no way to test the spillway’s integrity until the releases earlier this year (first in over 6 years) revealed the extent of the existing damage. Unfortunately, the authorities grossly underestimated the structural deficiencies which in turn led to the catastrophic failure of the lower half of the spillway. Of more concern is the emergency spillway, which is nothing more than a low-point in the rim around Oroville. Once lake levels exceeded 900′, the overflow was/is totally uncontrolled, with the overflow flowing down unlined earthen slopes. The emergency spillway had never been used, and once the backcutting was observed, a 30′ high failure of the emergency spillway became imminent….hence the evacuation orders that displaced over 200,000 people in a matter of hours. It should be noted that Lake Oroville is quite seismically active, with a swarm peaking with a mag 5.7 quake occurring in 1975, six years after Oroville dam was completed. Data from these and subsequent quakes seem to confirm that the presence of the lake was re-activating long-dormant faults, and also that rapidly changing lake levels were exerting large hydrostatic forces on the surrounding terrain which in hindsight seems to correspond to heightened seismicity. Whether or not the ongoing seismicity played any role in aggravating the spillway’s structural failings is still under intense review, but what we do know is the bedrock at the dam’s base and underneath the spillway is far from a coherent structure, and as such is riddled with cracks and discontinuities. Most of Dawn’s work is done on sub glacial arctic lakes. She also worked on the EDL team for the Mars curiosity mission. Anthropomorphic induced quakes are pretty common around the clear lake geothermal plant which is not too far from Oroville. The whole region is pretty much a geological mess. There is a really good book called Assembling California by John MacPhee. He describes this sort of hill as like a blancmange pudding. A little bit of everything. The core bedrock is serpentine. When I did It for a civil engineering company in the late 1980s they referred to that as the glue that holds the mountain together. It also contains natural occurring asbestos and other fun stuff. On the other hand, gold panning licenses are up. Turns out you get them from the same place one gets hunting and fishing licenses. Finally finished the whole article. Thank you Albert very much. I am dreaming of writing such long posts perhaps one day! Thanks Albert, Great reading in any ways! For now, I’ll think of this sleeping behemoth as Alberts-jokul. Hm. Jokull means icecap, so in 200 years you would need to find a new name. And the name ‘Alberta’ is taken.. perhaps we should not confuse google even more. …and if the Google algorithms can’t handle it. That means they need to work on the AI some more. For starters: I’d never *heard* of Corbetti! The wired site blocks access when you use an addblocker, so I can’t read his work. I think the choices are interesting and includes ones we have also covered. We agree that Campi Flegrei is very dangerous, much more so than Vesuvius. Taal is on our list and Aira could have been (but a big eruption there seems decades off). The one in Mexico has a good chance of an eruption in a crowded region, but it probably wouldn’t be a huge eruption. I am wondering why there isn’t anything in Indonesia but four in central America? Tatun would not have been on my list but I don’t know why he picked it. Tall is a good choice. Tour guides occasionally hype the island in the lake as the lake as the smallest volcano… but the lake is actually the volcano. The island is just a resurgent cone. I’d never heard of it either. Checked it out in google earth, and the little GVP blurb says it sits in an older 30x40km caldera. Search for Awassa, Ethiopia. Oh hey, is that a city sitting inside the caldera? But at ~200km from Addis Ababa it seems hard to justify it’s high ranking. And is it just me or is 30x40km really really big for a caldera in a spreading rift? That’s … huge. Calderas an form from explosions or from draining of the magma chamber. Inside a rift, you would expect the latter. The effusive eruption which drained it may have been 50 kilometers or more away. I don’t know whether there is any sign of something like this in the area! Update on Mauna Loa in case you have not been watching. At 5:11 4/15/17 HST there was a 2.9 at 7.4 km. The total amount of quakes in the outbreak area in the last two weeks is approx 71 but around 50 of these are less than 1.7 in Magnitude, which the HVO uses as a cutoff to compare current activity to older eruptions due to the improved sensitivity of the equipment. Add a 2.2 at 2.5km that just occurred. Does anyone have access to the instrumentation there? Mauna Loa has had swarms like this before which died down again. But this is closer to how you would expect an eruption to start. The swarm over the last day was a bit deep (8 km) and the M2 was not at the position of the swarm but at the summit. It doesn’t quite add up yet. Let’s see how it develops – or not. Drumplots from Webicorders can be found here. this is from the station which looks to be the closest to the recent swarms. to me it looks like magma moving followed by a thump followed by many aftershocks. Definitely some signs of hydrothermal activity mixed in with all the noise. Hvo is saying that there were around 150 quakes. That was written just before the earthquakes restarted, so doesn’t include yesterday’s swarm. after the M2 there hasn’t been any further recorded activity. So, I have noticed that the HVO is reporting that the “Summit sulfur dioxide emission rates remained high. ” at Kilauea and have been for a while. Could this be an indication of fresh magma entering the system? “remained high” indicates an ongoing process. I don’t know at what depth magma starts exsolving SO2, but my read would be that material is continuing to reach that depth. It is because of the lava lake. It is breathing directly into the air. Sulfur has been high for years. There is a continuous magma flow through the Kilauea magma chambers to the eruption site (Pu’o’o) and this releases some of its gas at Kilauea. For the interested, where availible, we here at VC appreciate properly cited reference material. Sure, we are a blog, but that doesn’t preclude us from being used in support of other people’s work. Proper citation here eases the work that other writers have to do to track down what we are talking about. … err, so how did Draugafell come about its name? Superstition or just a pervasive sulphur smell? Couple of possibilities. Draugar are undead (https://en.wikipedia.org/wiki/Draugr) so zombie mountain. But it can also mean lying (apparently – never trust someone who says they are lying), or injure (ski mountain?). And in Lithanian it means’friend’ . You could argue that all these meanings could describe a dormant volcano.. It is also the name of an exoplanet, so perhaps the mountain is named after that? USGS reports an M4+ earthquake in Iceland. Just under the famous plugg? Below the upper magma chamber, at least. I can’t tell whether it is up or down – that takes more expertise than I have! But I did notice that while this quake was close to the centre of the caldera (2km north of what IMO defines as ‘point zero’), almost all aftershocks are further north/northeast. It is silent further to the south. Albert, I don’t think the 4.2M quake was close to the centre of the caldera. Plotting the quake location on the VC map shows it to be on the caldera rim so indicative of the plug moving. This plotting is not 100% accurate though, but it did involve overlaying multiple maps to get the best estimate of the volcanic features. Point taken! The quake was closer to the centre than they usually are (2k versus 4-8 km typically), but the point IMO takes as zero is not exactly the centre of the caldera. So this still is the ring fault. It would be interesting to have GPS at this location. “An immense river that flowed from one of Canada’s largest glaciers vanished over the course of four days last year, scientists have reported, in an unsettling illustration of how global warming dramatically changes the world’s geography. According to the Gnomes of Editing there will be a part III of the Hekla series tomorrow. So they escaped the draugar that were chasing them around? They are valiantly dodging the Draugar. Cool, if they were violently avoiding, they would be knocking stuff over. And I think the cookie table might get knocked over again. Now, shallow swarm inside Katla with 2 M3 so far.. Very shallow. Ice-water-lava interactions? Note the one at depth and one at around 4km beforehand. As Carl said before, this is probably gas breaking rocks. Looks to me like there was some influx at depth and then gas release causing rock to break at pressure near the surface. 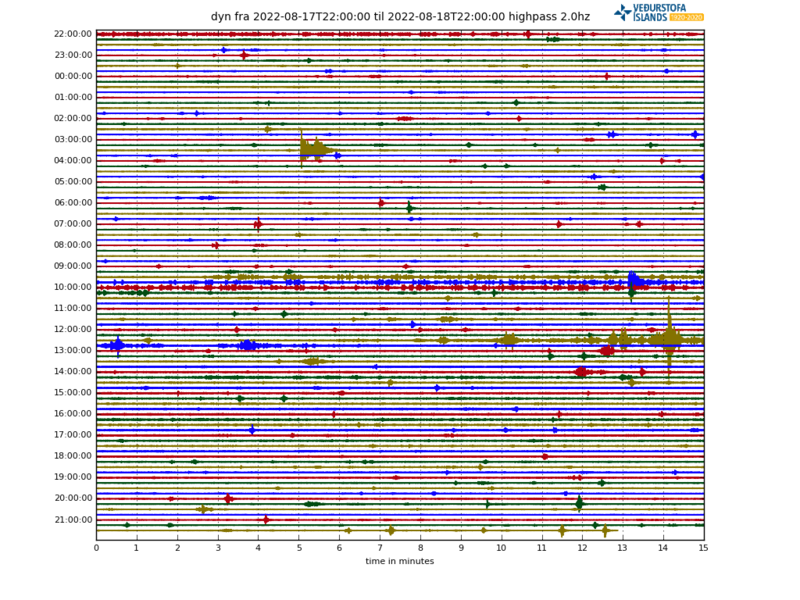 Etna is at it again, collapse event at 12:20 UTC and fissure cutting through the Southeast Crater, Tremor spiking. Sorry I meant to write 10:20 UTC. Hydrothermally driven earthquake activity exactly as you say. 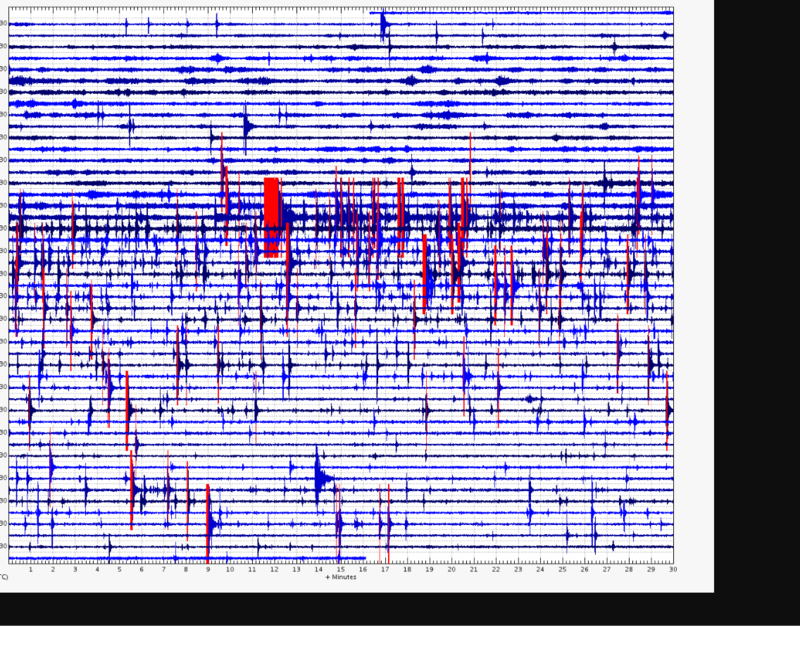 You can actually see the hydrothermal fluid move in the coda of the two larger earthquakes. I tried to fix things, but the comment was removed from the bin so I could not restore it. Good catch. I wonder if these were under the current swarm or if they were located closer to Godabunga or other volcanic systems nearby to Myrdalsjokull. There definitely have been deep quakes however around Katla, they just aren’t very large. This could simply be a product of it being somewhat of an open system and rather “hot” and ductile. We all know that certain volcanoes in Iceland can erupt without a huge amount of prior earthquake activity (Hekla, Grimsvotn, etc), and I think it’s worth noting that these volcanoes are some of the more active ones in Iceland. I wouldn’t expect a Katla eruption to feature as much of a dramatic run-up like we saw prior to the Holuhraun eruption unless it was a fissure eruption forming along Eldgja. Interesting that Jon Frimann reports that Icelandic media are saying that yesterday’s quakes happened away from any of the known hydrothermal systems in the caldera. But he also mentions that this location has seen eruptions in the past (and Eldgja may have started in this area as well), so hydrothermal activity is certainly possible. I would be cautious with surface quakes: too many things can cause them. Perhaps this is just an early start of the summer melt season, after the mild winter. Albert that was kinda my point; this may be a *new* hydrothermal area forming. Numbers are caldrons and the small red circles are 2011 quakes. This graphic from an unknown paper shows a similar setup, not sure what the numbered areas correspond with until I get hold of the paper. Area 7 seems to be the area where the recent quakes occurred. It is no the first time in past years deeper quakes under the east rim were followed by an uptick in shallow quakes. It was visible in one of your sequence graphs IanF, tried to find it, but the link is broken. So the earthquakes at 15-20 km depth went away, mainly after the big one at 2003, but instead we now have events at 20-25 km. Or could this be caused by better monitoring? How seasonal are the earthquakes? I would say that better instrumentation skews this data to a great degree but more on the shallow activity than the deep quakes. However, i would think the larger quakes at 15-20 kms would still show as the detection improved so I think this shows a distinctive change in the quake pattern. When I look at these patterns I see from 1999 to about 2004 possibly pressure from deep was injecting magma into the 15-20 km region and then this region opened up and became much easier for intrusions from much deeper to fill from below. Tell that to the thousands of sailors who have pondered it for hundreds of years. Full-Earth monitoring to come. And it includes an interview with Boris! This reminds me of the new google earth update. In a brief Q & A we discus Heklas eruptions, glaciers and flood basalts!